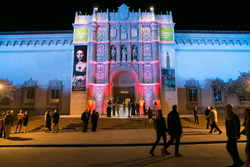 Balboa Park After Dark has just three Fridays left this summer, with several special exhibits wrapping up at certain museums. Last call for night hours will be September 1, 5:00-8:00 pm. This will be the final Friday for theNat’s Ultimate Dinosaur exhibit, featuring augmented reality technology, wherein full-scale dinosaurs are transformed into flesh-covered, animated beasts. The San Diego Museum of Art’s Richard Deacon exhibits wraps up Labor Day weekend. Richard Deacon: What You See Is What You Get is the renowned British artist’s first major museum survey in the United States. Deacon has been exhibited frequently internationally and remains a pioneering figure in the field of contemporary sculpture. Finally, the Mingei’s American and European Folk Art exhibit ends August 20. This exhibition is dedicated to three centuries of American and European folk art from the Museum’s permanent collection, with many artworks on view for the very first time. Food Truck Fridays continues through September 29, this week offering everything from Thai to Caribbean to Belgian Waffles, plus live entertainment by Redemption Brass. Food Truck Fridays runs 4:00-8:00 p.m.
Late hours begin July 7. Special $5 admission price. In addition to the museum being open until 8:30 pm each weekend, enjoy special sunset tours of the California Tower (timed tickets required) and the newly opened Living With Animals exhibit. Art After Hours every Friday. Special $5 admission price. Open until 8:00 pm Fridays with half-priced IMAX films at 7:00 pm in the Heikoff Giant Dome Theater in May and June. Open extra late on Fridays in July and August for video game madness in Game Masters. Balboa Park Explorer passholders receive free general admission. Purchase your Explorer Pass today at https://explorer.balboapark.org/. *Museum of Photographic Arts (MOPA) is open until 8:00 pm on Thursdays (not Fridays). The San Diego Museum of Man is open until 8:30 pm Friday–Sunday, plus Labor Day and Memorial Day. Extended hours at other museums may vary and are subject to change. Please visit the website of the institution you wish to visit for more information. Balboa Park Cultural Partnership is a nonprofit organization through which 30 arts, science and cultural institutions in Balboa Park collaborate to achieve shared goals. By helping these groups achieve greater organizational efficiency, innovation and excellence, it seeks to contribute to the vitality and sustainability of Balboa Park. For more information visit http://www.bpcp.org. Visit us at Facebook.com/ExploreBalboaPark, Instagram.com/ExploreBalboaPark, Twitter.com/ExploreBP.